Quercus' latest full-length offers a likeable, if confusing, mix of goofiness, uplifting moments and Doom. 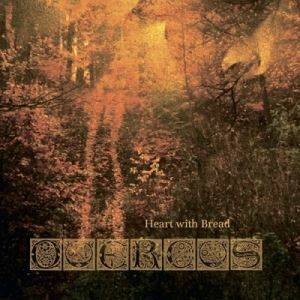 Opening with a well written pipe organ piece, Quercus's album, 'Heart With Bread' quickly establishes itself as unique. Following the pipe organ, the opening track falls into the sound of ringing chimes as the band fades in. The opening riff is well put together, complete with long drawn out chords, tragic leads, a distinct bass-line, and an interesting drum-kick pattern that makes an otherwise good intro great. Unfortunately, the momentum the beginning track 'A Canticle For The Pipe Organ' carries doesn't last throughout. 'Heart With Bread''s production may be its strongest attribute. The album is definitively Doom Metal, exuding that noisy, reverb-filled sound so characteristic of the genre, while at the same time giving every part and instrument clarity on the soundboard. This is an impressive thing considering how much is going on in most of the arrangements. The aforementioned pipe organ is present on many tracks, often playing with the band, and even then everything remains clear. In addition to this, there are many soaring leads that never seem to step on the rest of the band, and the vocals sit nicely in the mix as well. Quercus achieves atmosphere without minimalism, and this is a remarkable feat considering that such arrangements usually pull off sounding 'big', but maybe not 'atmospheric'. The songwriting is mostly well put together, but there a few "uplifting" moments that confused me as a listener. Combine this with some of the goofy song titles, such as 'Illegible Tree Name', and it makes me wonder how seriously Quercus takes their album as a whole. The uplifting moments aren't bad, in fact the fourth track 'Silvery Morning' is quite a good song that seems to hang on these sections exclusively, but they feel out of place, and the album loses coherence in this regard. Playing Doom in the major key is not an easy thing to do, and while Quercus doesn't fail at it, they don't knock it out of the park either. As for the vocals, there isn't much to say about them. For a band that plays such melodic parts, it would be interesting to hear a few vocal melodies in some places, but Quercus's vocalist hangs mostly on growls, with a few raspy parts thrown in. These neither add nor deduct from the music in my opinion. Except for the second track, there was not a single vocal part that seemed to contribute to the music or act as a genuine piece of the songwriting, but at the same time, the vocals followed the growling Doom convention perfectly, and never seemed to hurt any of the songs. As for their tone, it's generic, but on the good end, as in, I've heard it several times before, and while the vocals do nothing new, they do nothing wrong either. Coming to the end, 'Heart With Bread' leaves me feeling a little confused. There were parts I loved, and there were parts I found cheesy, but no parts that I hated. My trouble with feeling the vibe of the music - mostly due to those major key parts I didn't quite find justified - isn't attenuated with the goofy song titles, ones that don't seem to flow from the feel of the music or the artwork. If you want to listen to something a little different, I'd give Quercus a shot, but they might not be for everyone.